El Campello is a tourist resort located on the Northern Costa Blanca in Spain. El Campello is easily accessible to tourists arriving at Alicante Airport because of its close proximity to Alicante and its rail links to the city. El Campello is particularly popular with Spanish tourists and is the place to come to enjoy some fine Spanish and Mediterranean cuisine. El Campello has a good range of accommodation to choose from such as villas and apartments as well as a good selection of hotels. Hotel rooms can be rented from as little as €27 a day and highly recommended hotels include the Pueblo Acantilado Suites, Gran Hotel Campello, Playa Campello, Hotel Jorge I and the Hotel Nuria. Budget accommodation can be booked at the Hostal San Juan. The best beach to visit in El Campello is the Muchavista Beach. Playa Mucahvista is seven kilometres long and has maintained its blue flag status for many years. El Campello is a very Spanish resort with many good Spanish restaurants. According to the Trip Advisor the best places to eat out include the Cerverceria Paquito, Star of India, Browns, La Cova, Restaurant Singapore Gardens, La Vela and El Chiringuito. Although there are no golf courses in the resort itself less than fifteen minutes away by car keen golfers can play on the Alicante Golf Course which is located to the south of the resort and to the north west of the resort in the town of Mutxamel on the Club de Golf Bonalba. On the nightlife front although the resort doesn’t match the nightlife of Alicante or Benidorm, locals recommend El Huello as the place to come and let your hair down. Benidorm can also be easily accessed by the Alicante Night Train as an easy way to enjoy all the nightlife in the resort. British tourists have mentioned that the El Torro Bar is well worth a visit. More El Campello bars include Chimo, La Teja and the Cantina Popeye. Chimo is also the place to come to enjoy some fine tapas. Some of the more popular things to do while on vacation in El Campello include a visit to the Canelobre Caves in Jijona twenty minutes away by car as well as visit the Benidorm theme parks. 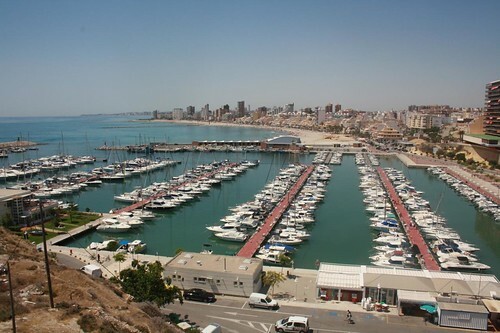 Alicante with its marina and promenade are also worth a day out. From the Alicante Port there are also day trips to Tabarca Island which is located just off the beaches of the tourist resort of Santa Pola on the Southern Costa Blanca. Address: Calle San Bartolomé – Esq. Ruperto Chapí 103, 03560, El Campello, (Alicante – Alacant). Opening Hours: Winter (01/10 to 31/03): Monday to Friday, 09:00 to 14:00. and 16:00 to 19:00 h. Saturdays from 10:00 to 14:00 and 16:00 to 19:00 h. Summer (from 01/04 to 30/09): Monday to Saturday from 10:00 to 14:00 h. and 17:00 to 20:00 h.
Address: Avenida Jaime I, El ConquisTador, Frente Urb. Tobago, El Campello. Opening Hours: From 02/08 to 31/08: Monday to Saturday, from 10:30 to 13:30. and from 17:30 to 20:30 h. From 01/09 to 15/09: Monday to Saturday from 10:30 to 13:30 h.
Here is a video showing some of El Campello’s most notable places.